A Cheap Vegas Wedding - Where Are The Cheap Chapels? 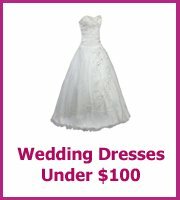 A cheap Vegas wedding is a fun alternative to spending a fortune on a wedding at home. But where are you going to get married? 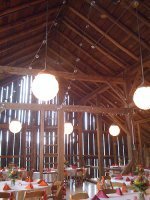 The average cost of a ceremony and reception is around $20,000. 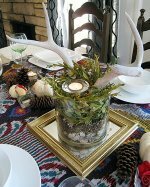 But for a fraction of that you could have a creative and entertaining inexpensive Vegas wedding. If you choose this route, here are a couple of ideas. One of the most famous wedding chapels on the Las Vegas strip, Graceland offers a traditional wedding package for under $200. The package includes the chapel, wedding music, a small bouquet, a boutonniere, photography, a wedding certificate holder, and photos (6 4 X 6 images and 1 8 X 10). You’ll need an extra $50 for the minister and $60 for the marriage license, too. Altogether, you could get hitched for a little over $300. You could easily win that much at blackjack. Of course, most people don’t go to the Graceland Wedding Chapel just for a cheap Vegas wedding. They want an Elvis wedding. For $329, you can have everything in the $200 package, plus an Elvis impersonator will give the bride away and sing three of “his” songs. You’ll also receive a copy of the marriage certificate given to Elvis and Priscilla when they tied the knot. Remember you’ll still have to pay the minister and marriage license fees separately, but that’s a lot cheaper than most of your local wedding options. Reviews on Graceland wedding chapel at TripAdvisor. 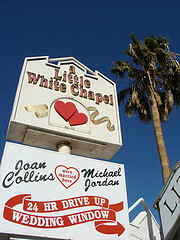 If the Graceland prices were too expensive, you might want to consider the drive thru special offered at the Little White Chapel. You can get married for as little as $40 if you use your own car. You’ll need the marriage license, of course, but this is one of the most affordable and bare bones wedding ceremonies you can find, even in Las Vegas. For roughly $100 more, you can choose one of the upgraded drive thru wedding specials which include a courtesy limo, keepsakes, a rose, a ceremony, and a few other extra. If you don’t want to get married in your car, the chapel has several other venue options available. While the above are examples of cheap Vegas weddings, you’d be surprised how much a few hundred dollars more might get you in Las Vegas. If you head to Treasure Island, for example, you can snag their Elegance Wedding Package for only $599 (you have to pay $100 more on the weekend). For that price, you’ll have the services of a wedding coordinator and an officiant to perform, a bouquet and boutonniere, a private dressing room, thirty minutes in the chapel for the service, bridal garter keepsake, choice of CD musical accompaniment, a bottle of wine, professional photography including a wedding album of 12 4 X 6 pictures, and a personalized copy of your wedding certificate. If you don’t mind spending $800 on your cheap Vegas wedding (or $900 if it’s a weekend or holiday), you should go to the Venetian Hotel & Casino. The hotel offers a wedding package at this price point that lets you exchange vows on an authentic Venetian gondola while floating on the Grand Canal. The package includes the gondola and the officiant, as well as a bouquet, boutonniere, and two 5 X 7 photos. Reviews for The Venetian at TripAdvisor. Because Vegas is home to so many chapels, you’re going to find plenty of options for a cheap Vegas wedding and maybe even a not-so cheap Vegas wedding. 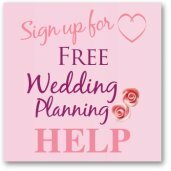 Remember to book your wedding in advance if you’re going through most of the hotels and even some of the chapels. If you’re not sure if reservations are needed, call ahead and ask so you don’t arrive and end up disappointed on your wedding day. Keep in mind you will need the money for the marriage license, as well as the costs of the wedding package you choose. Plan on spending at least one night in Las Vegas, too. You can always call it the start of your honeymoon.